Vertical counter battens, minimum 25mm by 38mm battens are fixed to the wall at 400 or 600mm centres. 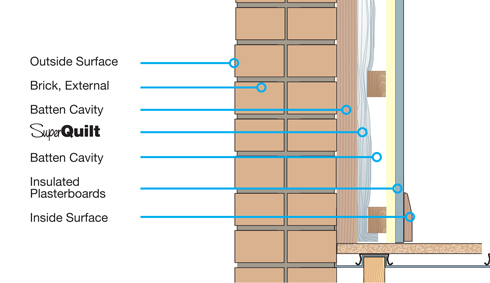 Battens must always be placed at the top and bottom of the wall and around the perimeter of doors and windows. SuperQuilt is applied directly from the roll either vertically or horizontally depending on the wall height, pulled tight and stapled onto the battens at minimum 300mm centres. Counter battens are fixed to the wall battens through the material at 400 or 600mm centres.